Bharat Nirman campaign: The Bharat Nirman campaign launched by Press Information Bureau at Shahkot with a purpose to disseminate information on various welfare schemes, being run by the central and state governments, concluded on Saturday. Punjab Revenue & Rehabilitation Minister Ajit Singh Kohar said such awareness programmes were very beneficial in remote and backward areas like Shahkot. He urged the authorities concerned to implement the development schemes irrespective of any political ideology they adhere to. He reiterated his own commitment for the development of his area by rising above the party interests. He regretted that the underground water in this area was highly polluted and that funds have already been earmarked for its treatment so as to provide safe drinking water to the people. On this occasion, Jalandhar Deputy Commissioner Priyank Bharti lauded the venture of PIB for launching such information campaigns. Girl sustains burns: Suman sustained critical burns at her house in Bhularai village on Saturday. She was brought to the Civil Hospital, from where she was referred to Ludhiana. She sustained 90 per cent burns. The exact cause of the mishap is not known. The police is investigating the matter. People protest against police: Protesting against ‘partial’ working of the police, hundreds of residents of Noormahal, led by SAD and BJP leaders, sat on a dharna in front of Noormahal police station here on Sunday. SAD leader GS Bhullar alleged that the Noormahal police was falsely implicating innocent persons in different cases, but protecting anti-social elements. The protesters threatened to block traffic on March 29 if the police did not change its working. Manholes lead to accidents: Open manholes on the main GT Road are leading to many accidents in the town. A 3-year-old girl died two days ago and five persons, riding on bikes, were injured yesterday in accidents. Today, the traffic was disrupted for hours after truck’s rear wheels got stuck on a manhole. Alumni meet at GCG-11: The Postgraduate Government College for Girls, Sector 11, organised its alumni meet on Sunday. Surinder Paul Kaur, who passed out in 1958, and Kamaljit Sandhu Kooner, from the 1969 batch, and first woman to win a gold medal for the country in Asian Games were felicitated. They addressed a gathering and also shared their experiences with others. Elected: Elected office-bearers of Food and Supplies Department Gazetted Officers Association: President: Capt Parveen Vij; vice-president: Sukhdev Singh; general secretary, Dr Rajat Oberaoi; joint secretary: Sarbjit Singh and cashier: Joginder Singh. Three firms debarred for 3 years: The Haryana Government has debarred three firms, namely Chandigarh Medical Corporation, Chandigarh, Bansal Industries Corporation, Secunderabad, and Jai Shiwam Industries, Bhiwani, for a period of three years from doing business with the state government. Stating this here on Thursday, an official spokesman said the High Powered Purchase Committee (HPPC) had placed supply order with Chandigarh Medical Corporation for purchase of four suction pumps required by the PGIMS, Rohtak, but the firm failed to supply the equipment. Similarly, Bansal Industries Corporation and Jai Shiwam Industries failed to supply the material ordered by the HPCC. All set for rabi season: The Haryana Government has made all arrangements for smooth procurement of wheat during the Rabi season-2011. Food and Supplies Minister HS Chattha said the state government was committed to making the payments to the farmers within 48-72 hours. For this, cash credit limit of Rs 7,373 crore had been arranged from the Reserve Bank of India for purchase of wheat. He said the wheat procurement season had been notified from April 1 to May 31 and the staff of the procurement agencies would remain present in the mandis from April 1. Electoral rolls: Chief Electoral Officer, Haryana, Sumita Misra has asked those overseas electors whose place of residence in India is located in the state of Haryana and who have completed 18 years of age as on January 1, 2011, and are desirous of registering his/her name in the electoral roll, to submit their claim application in Form-6A for registration in the electoral rolls of the constituency in which his/her place of residence, as shown in the passport, is located. She said the application might be submitted either in person directly to the registration officer of the constituency concerned or sent to such registration officer by post. Iqbal panel: The one-man inquiry commission to look into the Mirchpur incident, constituted by the state government under Justice Iqbal Singh, has been given a second extension till September 13. The term of the commission was to end on March 16 this year. However, an extension was sought on the grounds that the inquiry was “derailed” following an agitation by Jats to secure the release of the accused in the Mirchpur case. Minister warns officials: The State Minister for Irrigation, Capt Ajay Yadav, while disposing of cases in a monthly District Grievances Redressal Committee on Saturday cautioned officials of disciplinary action if they were found wanting in their duties to implement the government policies sincerely and promptly redressing the complaints of the public. The minister, who is in charge of the Faridabad’s committee, disposed of 10 grievances of the public listed for hearing in the meeting. He further ordered probe as he was not satisfied with the response of the department concerned. Fire in grain market: Over 10 quintals of cotton was burnt in an incident of fire in the grain market at Bhattu Kalan on Sunday. According to reports, over 25 quintals of cotton belonging to a farmer was lying near the shop of the grain market. The reason behind the fire has not been ascertained yet. Eight bridges: State PWD and Industries Minister Randeep Singh Surjewala said here on Sunday that as many as eight bridges on various roads would be constructed in this area at a cost of Rs 25 crore. He said a bridge costing Rs 1.20 crore on the Kaithal-Manas road and another costing Rs 1.27 crore on the Kaithal-Sirta road were among these projects. Surjewala was addressing villagers at Patti Khot near here during his two-day tour of rural areas of the district. He said a milk plant at a cost of Rs 20 crore would be set up near Ujhana village. 31 cases settled at lok adalat: As many as 31 out of 63 cases were settled at a lok adalat held at Saran village here on Sunday. District and Sessions Judge RS Baswana presided over the proceedings of the adalat. The settled cases included 31 related to land mutation. Dyal Singh College convocation: The Kurukshetra University Vice-Chancellor, Lt-Gen DDS Sandhu (retd) on Sunday urged the teaching community to inculcate ethical values in students. 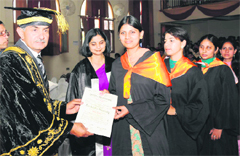 Dr Sandhu, who was the chief guest at the 52nd convocation and the prize distribution function at Dyal Singh College here, said knowledge was pouring from all directions in today’s fast-moving world and it was imperative for the teachers and students to keep themselves abreast with latest knowledge, research and technology to stand in competition. As much as 447 students were ordained with degrees and 48 students were given prizes for outstanding achievements on the academic front. Office-bearers elected: A prominent businessman of the town and a philanthropist, Arvind Bansal, was on Sunday unanimously elected president of the town’s prestigious Sirsa Education Society. Advocates Kulwant Rai Jindal and Naurang Singh were elected secretary and cashier, respectively, of the society. The election for the post of the vice-president was put off as both the candidates - Bhagirath Gupta and RD Garg - withdrew their nomination papers. The Sirsa Education Society runs five prestigious educational institutions of the town - CMK National PG Girls College, National College of Education, LHRP College of Law, GRG National Girls Senior Secondary School and Jan Shikshan Sansthan. Legal literacy camp: Chief Judicial Magistrate (Major) Phalit Sharma inaugurated a legal literacy camp at Jatheri village here on Sunday. The camp was jointly organised by the District Legal Services Authority and the OP Jindal Global University, Sonepat. He recalled that earlier when the joint family culture was a way of life, the disputes used to be settled by the elderly or the society. Prof Ajai Pande of the university said on the pattern of the Legal Services Authority, there was a provision of paralegal training for a period of one year for the villagers in the university. The details of the Right to Information, Right to Education, Laws against Domestic Violence, Rights of the Senior Citizens and Information on AIDS were also given to the villagers. Seminar on orthodontics: A two-day postgraduate students’ seminar on orthodontics was inaugurated on Friday by Health and Family Welfare Minister Rajeev Bindal at Atal Bihari Mountaineering Institute, Manali. As many as 900 dentists, including renowned professors from all over India, participated in the seminar. The seminar was jointly organised by Government Dental College, Sundernagar, and the Indian Orthodontics Society (IOS). Bindal said the state government had announced “muskan” scheme for senior citizens that would provide free denture to them from teh government hospitals. The minister also said seats for MBBS in the IGMC had been increased to 100. 12 hurt in bus mishap: Twelve passengers travelling in a private Kangra-Chamba bus were injured, including bus driver Om Prakash, when it met with an accident at Sadwan near here on Sunday. The steering of the bus got jammed and it dashed against a roadside tree injuring passengers sitting on the front side. Villagers immediately started relief operations and shifted injured passengers to the Civil Hospital. Local MLA Rakesh Pathania, who visited the hospital, directed the authorities to provide free treatment to the injured. The police has registered a case under Sections 279 and 337. Doc found dead: Medical Officer BL Verma, serving in primary health centre (PHC), Kherian, near here, was found dead in his house on Saturday. According to information received, when the doctor did not turn up at a meeting scheduled in the PHC on Saturday, the staff tried to contact him on his mobile, but there was no response. The police and officials of the Health Department reached the doctor’s house and had to open the door. He was found dead in his bathroom. The cause of the death was said to be a cardiac arrest. Seminar on ayurveda: With a view to popularise ayurveda in the state the government had enhanced its budgetary provision by 40 per cent this year with an allotment of Rs 156 crore as against Rs 40 crore last year. Health and Ayurveda Minister Dr Rajiv Bindal said this while addressing a one-day seminar on ayurveda which was organised by the Central Regional Research Institute, Mandi, and Ayurveda Department here on Sunday. A three-day free ayurveda health camp was also started here. Minor murdered: A six-year-old girl was found murdered at a village in Kupwara district of north Kashmir here on Saturday. The police recovered the body of Asra Shafi, daughter of Mohammed Shafi, a resident of Tikker, near Government Middle School, Tikker. The body had a visible mark of a slit throat, the police said. After completing legal formalities, the body was handed over to the family of the deceased. A case under Section 302 of the RPC has been registered and further investigations are on. Meanwhile, the Shopian police has recovered the body of a retired doctor, Maqsood Ahmad, a resident of Sofannaman, Shopian, from an Alto Car, which fell into a stream near the Gagran Memender road. A case has been registered. 2 killed at rail project site: Two workers were killed at an under-construction railway bridge over the Chenab in Reasi district on Sunday as a basket attached to a crane carrying them unhooked and fell from a height of more than 100 metres. Officials said the deceased, Abdul Rahman (34) and Jumma Baksh (24), hailed from Dwara village in Sidhi district of Madhya Pradesh. The mishap took place at around 10.30 am at the site near Bakkal village, about 45 km from Reasi. Both were rushed to the government hospital at Reasi but they succumbed to their injuries on the way. The duo was working for a private company, AFCONS, hired by the Konkan Railway Construction Limited for construction of the bridge on the Katra-Qazigund railway link, proposed to link the Jammu region with the Kashmir valley. This is the first such incident after the construction began in 2005. Varsity to introduce Mohinder Kaur fellowship: Punjabi University, Patiala, will introduce a fellowship carrying an amount of Rs 10,000 per month in the name of Sardarni Mohinder Kaur, Honorary Director of the university’s Dr Balbir Singh Sahit Kendra, Dehradun, who passed away recently. The kendra will be developed into the Centre for Sikh Studies to carry out quality research in the area of Sikh studies and comparative religion. Giving this information on the occasion of the bhog ceremony of Mohinder Kaur, Vice-Chancellor Jaspal Singh said the university would also start a memorial lecture series in addition to dedicating a classical Gurbani music programme in her name. Registrar Dr Manjit Singh, Dr Jodh Singh, Dr HS Pannu, Dr Gurnek Singh, Dr Sarbjinder Singh, Dr Balkar Singh and Dr Kehar Singh also paid tributes to Mohinder Kaur. CM administers polio drops to kids: Chief Minister Ramesh Pokhriyal Nishank administered polio drops to children less than 5 years of age on the occasion of the Pulse Polio Day here today. The campaign was held at the Doon Hospital (Women). Speaking on the occasion, the Chief Minister said the government and the non-government organisations should work towards making Uttarakhand a polio-free state. He said no case of polio had been reported in the state after 2009. DG, Health and Family Welfare, Asha Mathur, CMO RK Pant and other officers of the health department were present on the occasion. 20 youths duped of lakhs over job promise: A case of fraud in which at least 20 youths were duped into paying money for getting a job in the Haldwani Medical College has come to light. The accused, identified as a resident of the Kusumkheda area of Haldwani, had allegedly taken Rs 2-3 lakh from the victims and issued them false appointment letters with a proper stamp and signature of the Principal of the college. The appointees had allegedly been given false identity cards and even their fake bank accounts had been opened. The matter came to light when the accused started dillydallying on the date of their joining service and the victims decided to approach the college authorities. The said jobs were in the Class III and IV categories. Police investigations are on in the matter. Ganeshpur residents demand action against SI: Residents of the Ganeshpur locality of Udham Singh Nagar are agitated over the failure of the Police Department to take action against a Sub Inspector (SI) posted at the Transit Camp Police Post for seeking bribe from a resident for issuing him clearance for obtaining an arms licence. The agitated residents staged a demonstration outside the District Police Headquarters on Saturday and have threatened to launch an agitation if the authorities fail to take action against the accused at the earliest. Earlier, on Friday they had demonstrated outside the police station under which the police post functions. Bankers criticise Central Govt’s anti-labour policies: Leaders of the All-India Bank Employees Association have criticised the Central Government for adopting anti-labour policies and promoting rampant privatisation in the banking sector. Speaking at a three-day meet of the association being held in Nainital, the leaders of the bank employees called upon various trade unions to come together on a common platform to fight against the anti-labour policies of the government. They were critical of the government for allowing massive privatisation of the banking industry that had led to the entry of multi-national banks in the country. They said this had damaged the traditional banking industry. They also spoke out against the contractual mode of employment being adopted by various institutions. Khatima residents seek better sanitation: Residents of Khatima in Udham Singh Nagar have approached the local administration with the demand for improving sanitation in the town. The residents have submitted a memorandum seeking an improvement in the sanitation services and stated that the heaps of filth in various parts of the town is an invitation to diseases like diarrhoea, malaria and influenza. They have also sought the cleaning up of drains in the town so that there is no water logging. PDS outlets found flouting norms, contracts cancelled: Gross violation of norms was found during the raids conducted by District Supplies Officer Shyam Arya at various Public Distribution System (PDS) outlets in the Bageshwar district on Saturday. The raids were carried out on the orders of District Magistrate CS Napalchayal. It was found that the PDS supplies were being sold at a premium in 18 PDS outlets. The contracts of these shopkeepers have been cancelled and even their security deposits have been sealed. Besides selling the supplies at a premium, the violators had not been maintaining a proper record of accounts of the supply and disbursement of various foodgrains from the outlets being run by them.